With enough room to fit the essentials, our Overnighter Bag celebrates the thrill of travel! Its carefree attitude is reflected in its straightforward construction and sturdy materials, beautiful but not too precious to toss in the trunk. 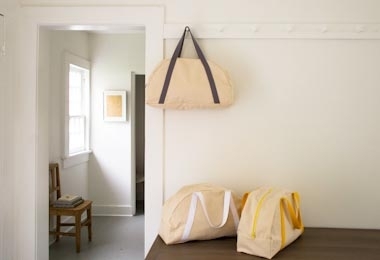 Purl Soho's Overnighter Bag Pattern carefully explains every step of making this stylish little duffle and is available as a PDF download or a hard copy. 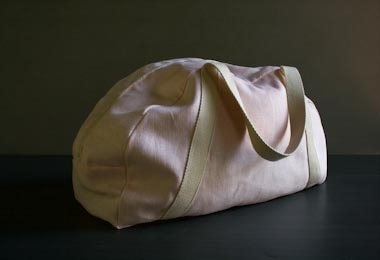 The finished Overnighter Bag measures 10 3/4 inches tall x 19 inches long x 6 3/4 inches deep. For a list of materials you'll need to make your Overnighter Bag, please click Product Details, above. 3/4 yards of medium or heavyweight fabric. 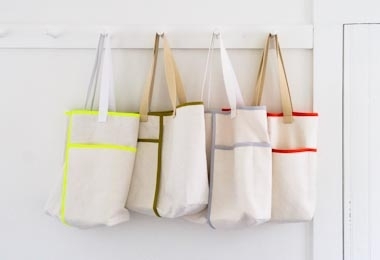 We used Purl Soho's Natural Canvas, 10-ounce. 5 1/2 yards of 7/8-inch bias tape. We used Purl Soho's Bias Tape By the Yard. 3 yards of 1 1/4-inch cotton webbing. We used Purl Soho's Sangle Cotton Webbing.